This photo was taken on the steps of the Library Building at University of British Columbia, Vancouver, B.C. Canada by Steffens-Colmer of 560 Granville Street, Vancouver. 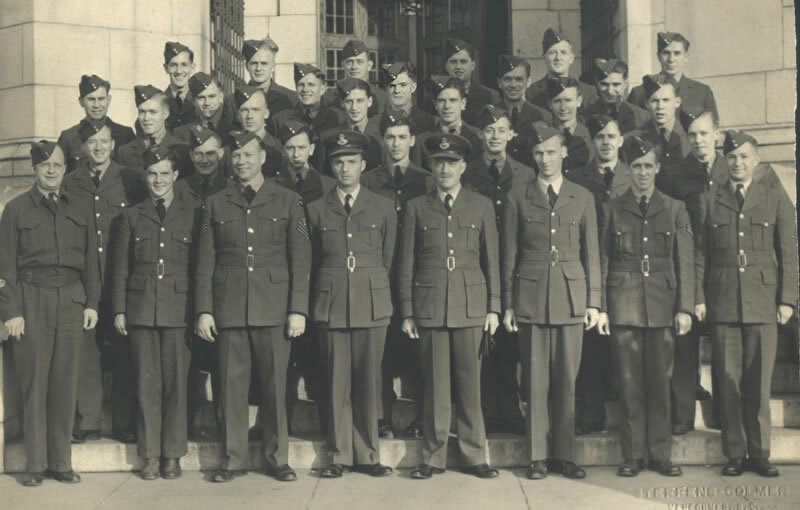 Both Walter Henry Powell and Cameron Clare Campbell had the photograph in their collection, so it marks an occasion, probably completion of the course on radar, math, and aircraft recognition. James McPhee, who also attended the course confirmed that it was on upgrading math skills, map reading and aircraft recognition. Sadly, he missed the photo op, and therefore is not one of our unknowns in this image. If you know of any of the people in this photo, or the more about the course, please contact us. Contact information is provided here. Those names with poppies beside are airmen who have died during the War. Those names with crosses beside are airmen who have died after the War.